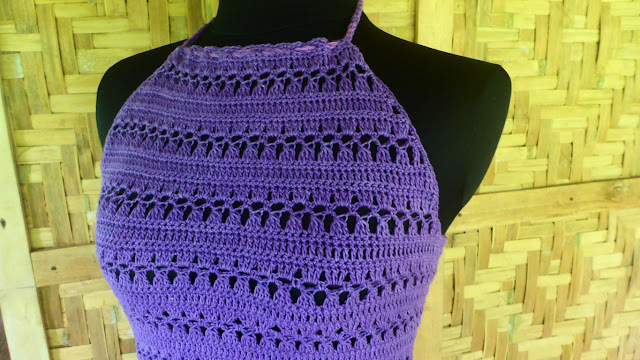 If you want to crochet a garment, I think a halter top is the best, most satisfying and easiest for a beginner. At first I thought that a skirt has got to be the easiest. But I was wrong. A skirt actually requires more skill. 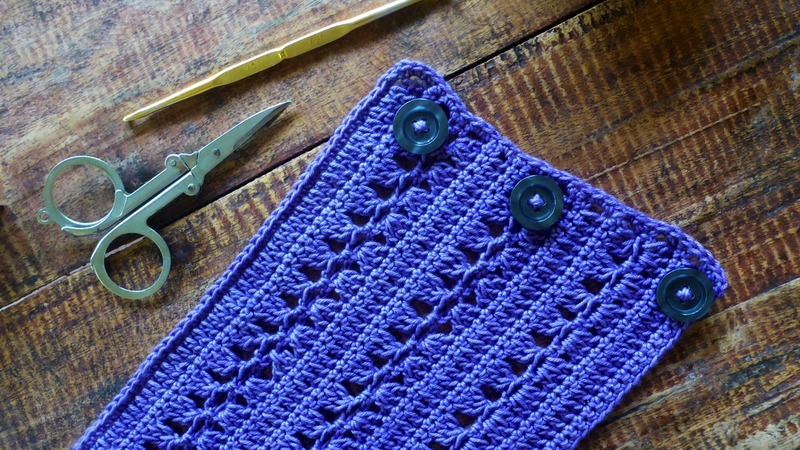 It needs good shaping otherwise it would look stiff or would bring out a lot of bulges. 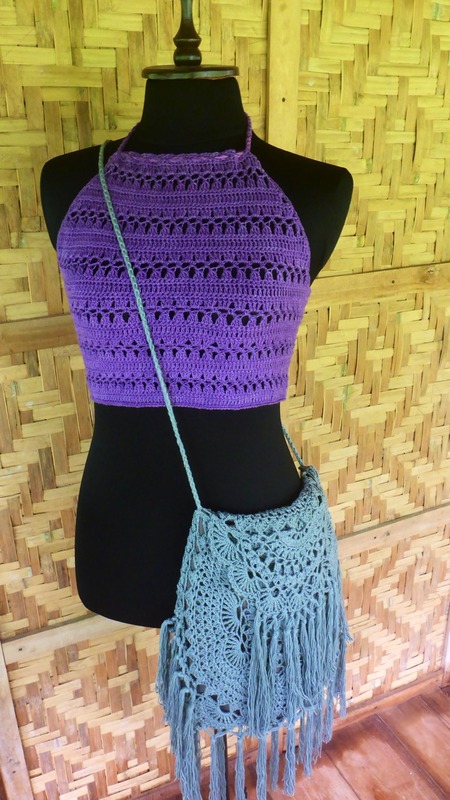 A skirt, even a short one, uses a lot of yarn too. A halter top, however, use less yarn and involves simple shaping. 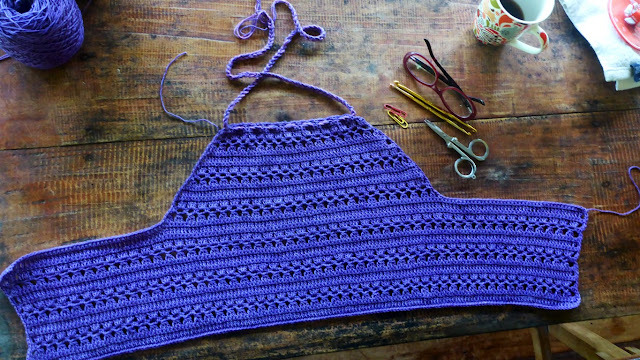 Here's a halter top that I started yesterday afternoon and finished today. I used 6-ply cotton yarn, 3.5mm hook and three plastic buttons. Work begins with a schematic of the halter top with my measurements. 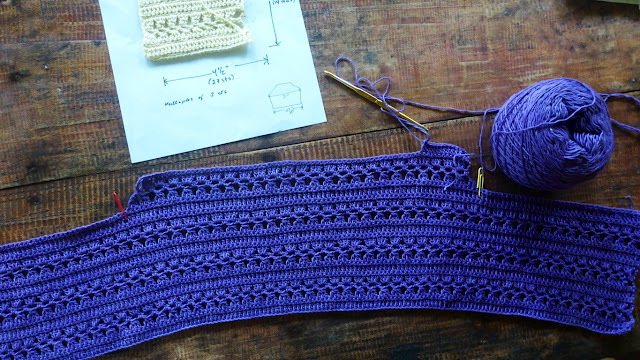 Then there's the stitch pattern and a gauge swatch. 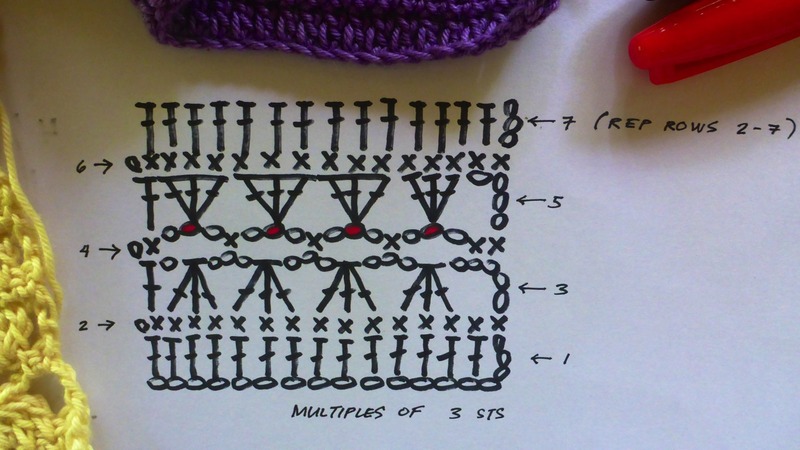 I'll use this lovely stitch pattern (below) to make the top. 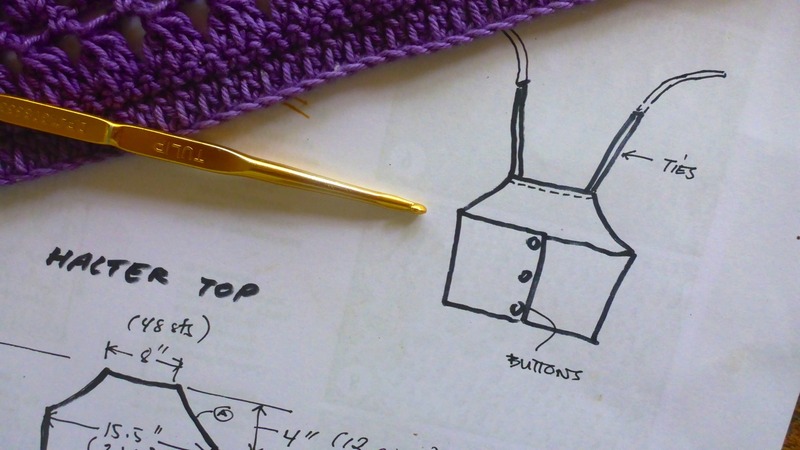 The top requires some shaping and this should be easy to do with the stitch pattern. The notes in the drawing above (notes A and B) indicate how the shaping may be done. 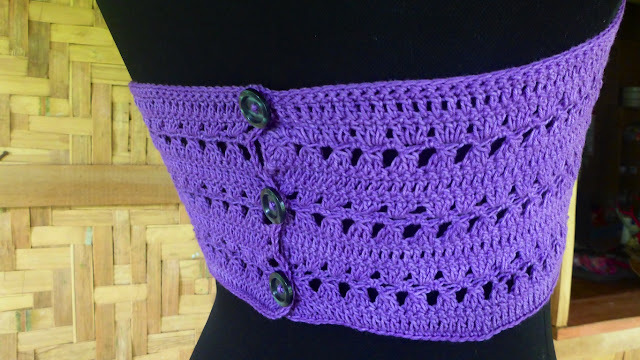 However, while crocheting, I realised that I didn't really need much shaping by increasing stitches for the body of the halter top. It was just a difference of about 2 inches from the waist to the bust. 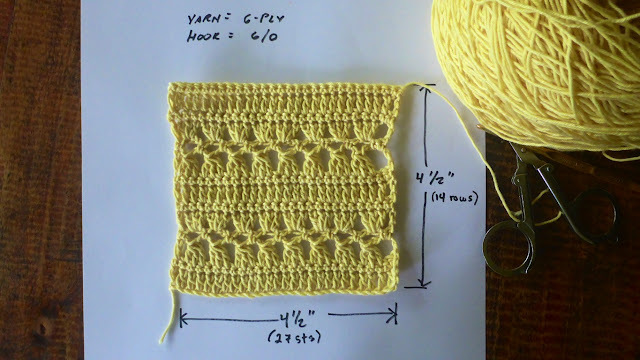 So all I really had to do was use a smaller hook (3mm) in the first several rows from the bottom, then switch to a larger hook (3.5mm) towards the top. Here (below) is the work in progress. I have just reached the section over the bust and shaping begins at the sides. Shaping decreases towards the neck so I had to had to skip 3 stitches at each side. 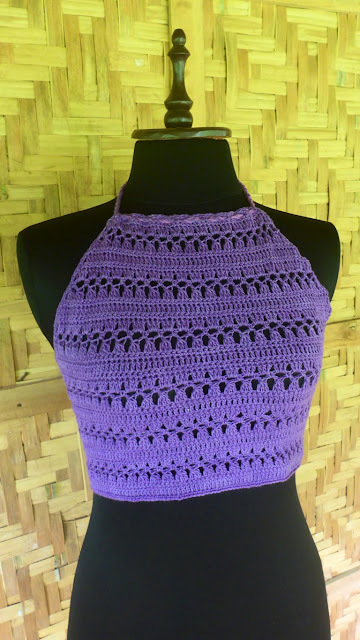 Here (below) is the finished halter top. I am yet to weave in ends and sew on the buttons. The strap is four strands of the same yarn, but I added two strands in lighter colour. The buttons are sewn on here. The holes in the crochet fabric serve as buttonholes. 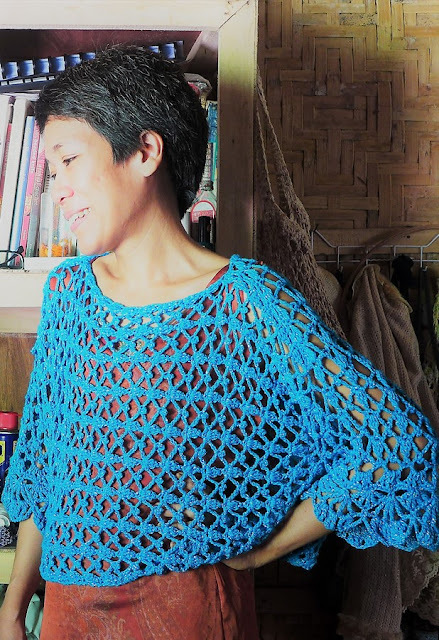 Here are photos of the finished garment. It is so easy to make. 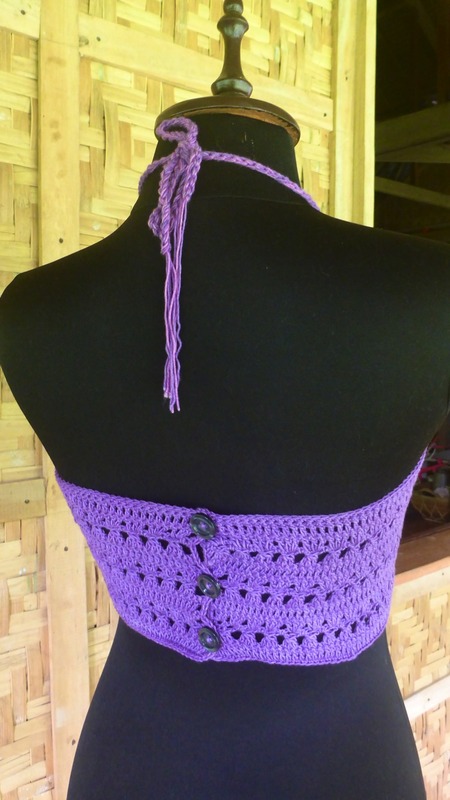 A simple crocheted halter top like this can also be embellished with beads and the like. Different colours of yarns may also be used. I absolutely love this! 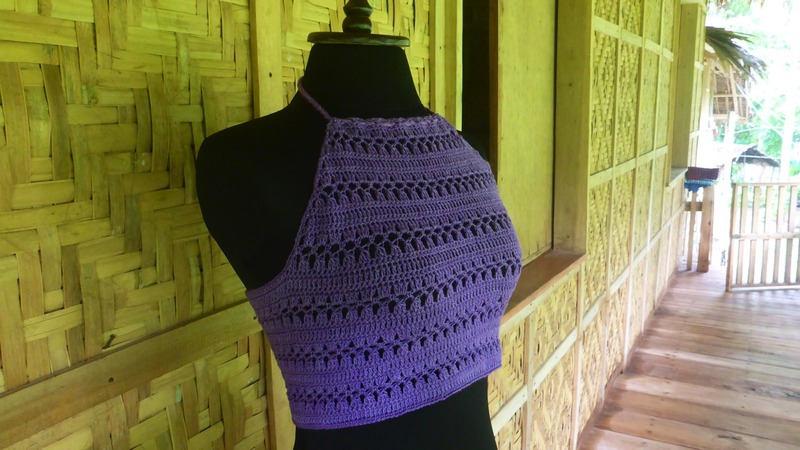 I've been wanting to try my hand at a halter top, but couldn't find a style of pattern that I really liked. This one is fabulous, I'll definitely be giving it a go! Thanks Sara. 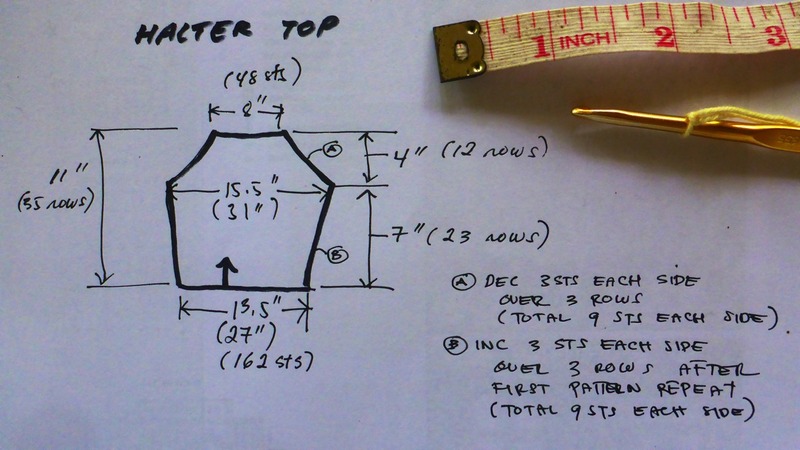 With this method, you can make a halter top that really fits you. I also thought of using elastics along the back, to keep it in place since I'm very thin. Ultimately, I ended up attaching the ties to the back. Darn!